A stranger rides into an isolated western town towing a lifeless body on another horse. The townspeople look upon him contemptuously, initially assuming that he’s committed murder. But the man introduces himself as Morgan Hickman (Henry Fonda), a bounty hunter who has arrived in town to claim his prize for tracking down the now-dead fugitive. 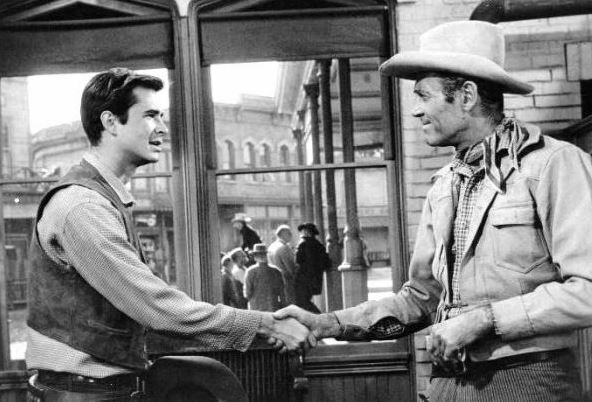 The temporary local sheriff, an uncertain young man named Ben Owens (Anthony Perkins), tells Morg that he cannot release the reward until the identity of the fugitive is verified. Forced to spend the night in the unwelcoming town, Morg cannot find a place to stay until he encounters a young boy, Kip Mayfield (Michel Ray). Morg, charmed by the lad, follows him to his mother’s place outside the town. Nona Mayfield (Betsy Palmer) welcomes Morg into her home, and reveals that her son’s father was an Indian, which has led to them both being ostracized by the judgmental people of the town. The following day, Ben is forced into action when local bully Bart Bogardus (Neville Brand) shoots an Indian in the street, claiming self-defense. When Ben tries to arrest Bogardus, the man refuses to go quietly and draws his gun, intending to shoot the sheriff. But a well-placed bullet from Morg puts an end to the confrontation. Ben is impressed with Morg’s skills, and soon gets Morg to admit that he had been a sheriff before giving it up to become a bounty hunter. Ben, who knows many in town want to take the badge away from him, talks Morg into teaching him all he needs to know about upholding the law so he can secure his position as sheriff. When a stagecoach is robbed and one of the men is shot, Ben is forced to deputize some men to form a posse and seek out the killers, though Morg refuses to wear the badge and join in. But Ben doesn’t count on Bogardus’ ability to inflame a mob, and when Bogardus leads his own pack of men out into the desert, intent upon lynching the murderers, Ben must finally gain the confidence to step up and stand between the mob and the outlaws in the interest of justice. The Tin Star (1957) was directed by noted filmmaker Anthony Mann, who initially made his mark in Hollywood as a skilled director of noir before shifting genres. The Tin Star is one of a number of Westerns that Mann directed during the 1950s. It came a couple of years after Mann’s prolific five-film collaboration with James Stewart, and was one of the last Westerns that he would make; Mann would pass away a decade later, after largely moving on to directing epics and war films in his final years. Thematically, The Tin Star is a Mann Western through and through, focusing much of its energy on developing the characters, giving them nicely fleshed-out backstories and building believable onscreen relationships between them. This is particularly seen in the characterization of both Morg and Ben. Fonda takes on a fatherly mentor role to Perkins’ character (albeit reluctantly), and Perkins, the earnest young greenhorn who doesn’t even know how to properly wield his guns, needs all the help he can get. And there’s an even more effective father-son relationship that develops between Morg and Kip, as the scarred man opens his heart to the young boy and his mother after the tragedies of his past. Fonda is a steadying, stalwart presence in the film, and plays well against the relatively inexperienced Perkins. Still, this movie really belongs to Perkins, who skillfully conveys Ben’s growth from an indecisive, naive boy to a commanding and confident sheriff. The Tin Star marks Perkins’ fifth film; he had earned an Academy Award nomination the year before in his second movie, Friendly Persuasion. Perkins almost missed out on the chance to play the role of Ben in this film due to illness; at one point, Jeffrey Hunter was set to star, but Perkins eventually recovered enough to begin filming. 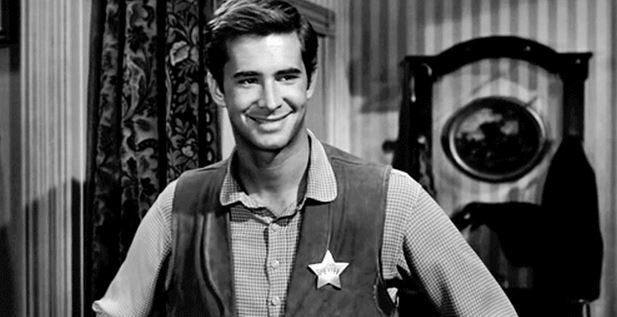 The Tin Star was released three years prior to Perkins’ casting as Norman Bates in Psycho (1960), the iconic role that would at once make him famous and typecast him for the remainder of his career. Here, in one of Perkins’ earliest film appearances, it’s easy to see the likable charm and vulnerability that would be twisted so effectively in Alfred Hitchcock’s dark film. 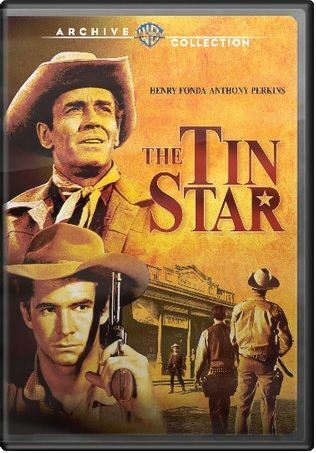 The recent Warner Archive MOD DVD release of The Tin Star boasts a lovely, clear print of the film. However, this edition of the movie lacks special features, though it does include (English) subtitles and a screen selection option. Though perhaps not as well-remembered as other entries in Anthony Mann’s impressive filmography, The Tin Star is nonetheless a solid Western, with effective staging, strong characterization, and stellar performances from its two leading men. The lovely score from Elmer Bernstein also helps set this film apart from its Western contemporaries; by turns stirring and gentle, moving and thrilling, it underscores the onscreen action beautifully. This is one that definitely will appeal to non-Westerns fans as well as those who wholeheartedly love the genre. True Classics thanks Warner Archive for providing a copy of The Tin Star for the purposes of this review. The ballad of Cat Ballou. ← Happy 85th Birthday, Mickey! Superlative review Brandie! Just about the best I’ve ever read on this particular film. This is a western classic for sure, and I would agree that it is one that would appeal to the non-genre lovers. I’d only pose to add here that Elmer Bernstein’s beautiful score another aspect that makes the film essential.